I believe (a large part of) my job is to collaborate and form relationships with other schools and school leaders. We must work hard to overcome the isolation that too often exists on campuses. So I was delighted to be invited to speak at Perez Elementary on their "College Day". I wound up having an absolute blast talking with and answering questions from 3rd and 5th grade classrooms about college. The students were so eager to learn and their questions were a great combination of hilarious, amazing, deep, goofy, and of course a few that made you just go "HUH!?" In the second classroom I visited, someone asked if I was an artist, and I told them "I'm pretty sure you guys are all better artists than me" which led to a few kids drawing on their paper and giving me their artwork. 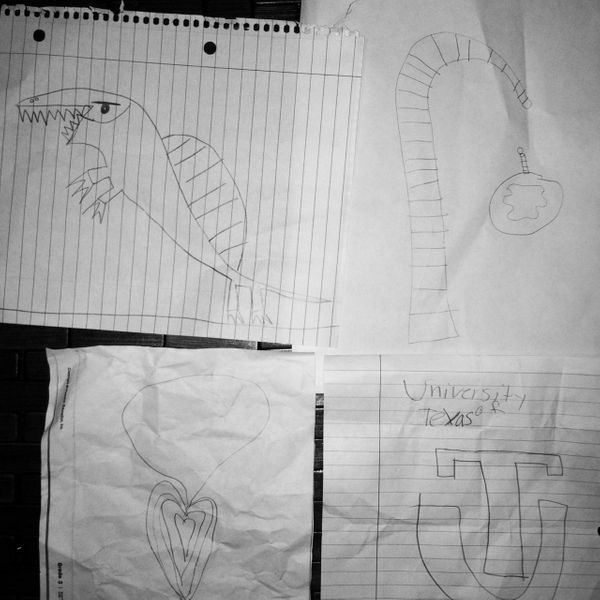 So here's a picture of their two minute drawings, and yes, they are all better artists than me! I also spent some time shadowing their amazing first year assistant principal, who happens to be part of my cohort in the University of Texas Principalship Program. Kara is so great at dealing with difficult student situations and truly cares about all kids. I enjoyed getting to visit with principal Dr. David Kaufman, who is clearly a strong leader, and one who has a powerful vision for what school should look like (and so glad to see that he didn't mean only high test scores). Thank you to Perez faculty and staff for allowing me to spend some time on your wonderful campus. I can't wait to visit again soon as a judge for your science fair projects!